Third-party logistics (3PL) providers are a key resource for companies that manufacture goods and for retailers. Recently, a top-10 global third-party logistics provider in the southeast U.S. that ships merchandise out of a 45,000 square-foot space was facing two challenges: not enough available labor and order accuracy. Products picked, packed and shipped range in size from collector coins to oversized teddy bears. Thousands of customers rely on this 3PL to accurately fulfill their orders in a timely manner. Learn how this 3PL overcame these challenges and improved order fulfillment. Labor shortages. Located in the heart of the warehousing industry, this 3PL struggled to hire associates to meet its growing demand. Inaccurate orders. The 3PL was using a manual picking system comprised of paper tickets and big heavy push carts. This antiquated equipment meant lots of unproductive walking for employees and picking accuracy problems, which lead to expensive and time-consuming re-work to correct orders during the packing process. 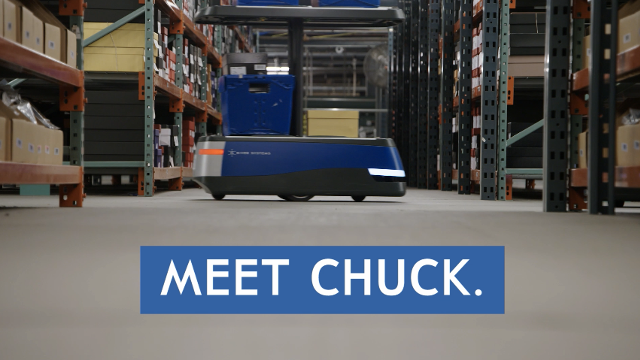 The solution was to partner with Massachusetts-based 6 River Systems and implement their collaborative warehouse automation robot, Chuck. Chuck doesn’t need wires, cables, or stickers to move around. State-of-the-art sensors help him navigate in any warehouse without any new infrastructure. Chuck leads associates to picks, showing important task information — item image, description, quantity, location, etc. — on a display the size of a tablet. This keeps associates on task, spending less time searching for items. Chuck’s high-powered, mounted scanner captures all necessary product information, including lot and serial number, in a single scan — allowing operators to pick hands-free. Work is prioritized by the system and assigned to associates through intelligent algorithms that maximize productivity and utilization — like Google Maps for your warehouse. Chuck gets around easily with a little help from compact TiM LiDAR sensors from SICK that use contours to efficiently guide him through a warehouse from one location to another quickly and safely. The navigation sensors on Chuck do more than just object detection. Chuck’s sensor is a non-contact ranging solution able to monitor large areas in indoor and outdoor applications – regardless of the surface or ambient light. Enclosed in a compact, rugged housing, his sensor provides accurate measurement data from the scanned surface, making it possible to determine additional information such as the size and shape of objects. The sensors are flexible for use in a variety of industrial applications as well as in building automation. And it’s easy to outfit Chuck with these sensors because of an integrated Ethernet interface, which makes for easy implementation and remote maintenance. Prior to the 6 River solution, the site’s baseline productivity was 61 units per hour. After one week of setup, the Chucks were up and running, and productivity increased to 151 units per hour. These improvements led to reduced overtime costs and better fulfillment of customers’ service-level agreements. Mistakes cost time and money. In conversations with the floor supervisors, 6RS learned that prior to deploying, the site struggled with order accuracy. Correcting mispicks is an expensive process that can cost an average of $22 per mistake, and, if they’re not caught in a verification process, they can lead to unhappy customers and damaged brands. With 6RS in place, the 3PL created a picking process that puts verification first. The 3PL moved off of a manual, paper-based process to one that includes scanning at the beginning, instead of just the final stages of the picking process. As for efficiency, thanks to the LiDAR-based navigation system in Chuck, movement throughout the facility is faster and more streamlined than any manual labor process that ever preceded it. And safety is even accounted for. The same sensors that help guide Chuck though the warehouse, are always looking for obstructions in his path. By sensing obstacles before a collision, Chuck’s navigation system also serves to help avoid injury to people and costly damage to assets. This is a guest post by 6 River Systems. 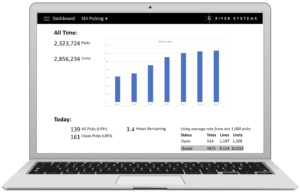 6 River Systems the creator of Chuck and creates turnkey fulfillment solutions paired with SICK sensor technology.